Do you have a passion for youth issues? Do you want to help northern youthÂ develop confidence, skills, opennessÂ and a healthy lifestyle? Are you between 18 and 29? Are you interested in going on tours throughout the Yukon, northern B.C. and Northwest Territories? BYTE’s facilitation team might just be for you. To join the facilitation team, we ask that applicants attend a bi-annual facilitation training in September or February as part of our selection for our new facilitation team members. 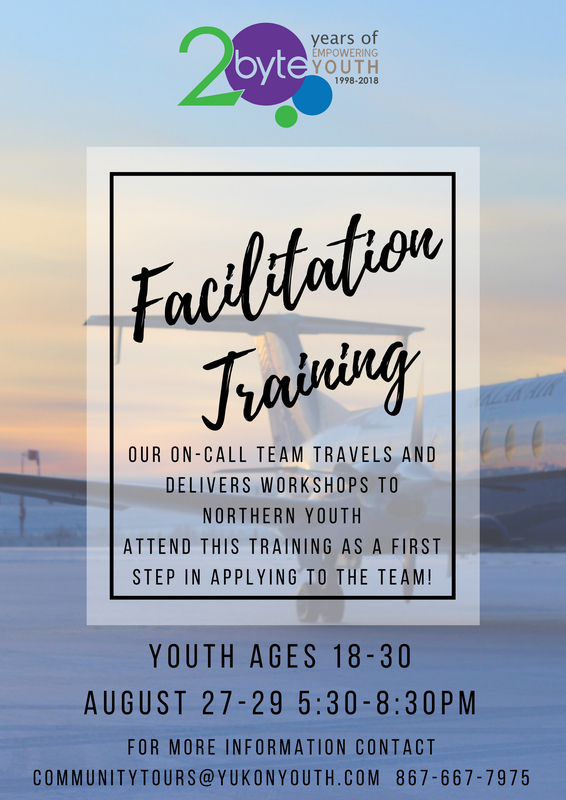 After the training, we ask that successful applicants submit a resume and fill out an application form to our Community Outreach Manager, ZoÃ© (communitytours@nullyukonyouth.com) by email or here at the BYTE office. Our upcoming training is onÂ August 27-28-29, 2018Â from 5:30-8:30. Please fill out this form if you are interested in attending. Read more about what it’s like to be a BYTE facilitator here.